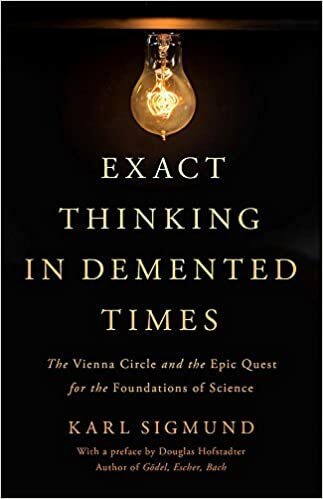 Karl Sigmund, Exact Thinking in Demented Times: The Vienna Circle and the Epic Quest for the Foundations of Science, New York, NY: Basic Books, 2017. Sigmund tells a riveting story about the intellectual vortex of ideas and thinkers centered on Vienna in early years of the 1900s, and how those thinkers survived (or in many cases, did not survive) those years of increasing violence and persecution, climaxing with World War II. Attempting to establish firm foundations for the new “scientific worldview” was an extremely future-focused activity, not to say visionary. Participants in the Vienna Circle — overwhelmingly male — were aiming at nothing less than the intellectual reform of humanity. To an astonishing degree, when one looks at the various threads of impact that ultimately radiated out of Vienna and into the world, from the interpretation of the implications of Einstein’s breakthroughs, to the development the fundamental mathematical theory behind the design of computers, to the invention of the use of infographics for public education, and more, they succeeded. To transform the world, we must begin with ourselves; and what is important in beginning with ourselves is the intention. The intention must be to understand ourselves and not to leave it to others to transform themselves. This is our responsibility, yours and mine, because however small may be the world we live in, if we can bring about a radically different point of view in our daily existence, then perhaps we shall affect the world at large. If you cannot or will not imagine the results of your actions, there’s no way you can act morally or responsibly. Little kids can’t do it; babies are moral monsters — completely greedy. Their imagination has to be trained into foresight and empathy. The category of “Philosophy” includes texts and artifacts connected to philosophical treatment of the future: examining our beliefs and concepts about it, as well as our interpretations of what science is telling us regarding what the future is, and how we should relate to it. Note that ethics and ethical deliberation is almost always concerned with the future, since ethics has to do with guidance for decisions and actions that have not yet been taken.